Figure 2.89. 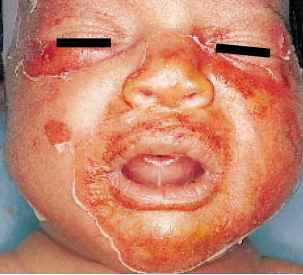 This infant at age 5 days developed fever, lethargy and poor feeding. On sepsis evaluation there was a pleocytosis of 120 WBCs in the cerebrospinal fluid indicative of meningoen-cephalitis. There was no evidence of cardiac involvement. The following day the infant developed a generalized maculopapular rash and loose stools. He recovered without treatment. Stool culture grew Coxsackie virus.